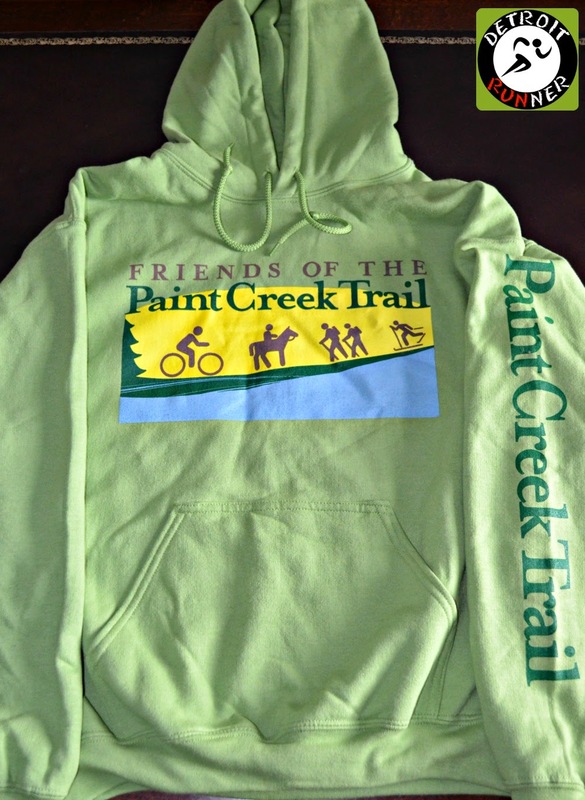 Yesterday, I decided to attend the Friends of the Paint Creek Trail fundraiser. They were having a 2 mile walk / 10k run on the trail and thought it would be fun. It was a free event but they were suggesting a $5 donation. I'm always willing to help out an organization like this to support the trail systems we have here. I got there about 8am and all you needed to do was sign up, sign the waiver and you were all set. The start was in Rochester Municipal park near the river and the trail. They had a covered area to sign up and you could buy shirts or sweatshirts too. I ended up purchasing a sweatshirt($25) for the event to help out the organization. It's a really nice and comfortable sweatshirt too. I also got a chance to see several other local runners including Ben, Marcela and her family, Kevin, and Sharry so we talked a little bit before the run. The organization did a group picture that they will put up on their website and we were ready to start the run for an out and back course. It was a sweatfest this morning with almost 100% humidity and a little breeze. 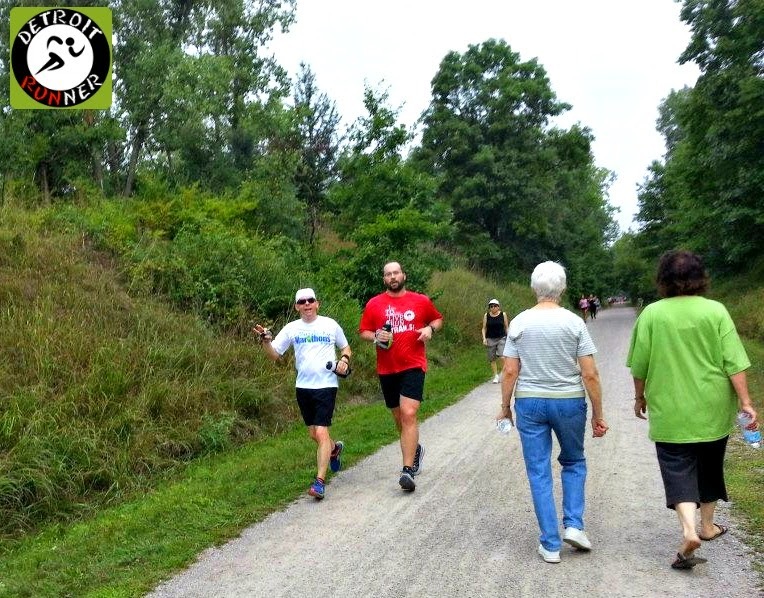 It was hot but I always enjoy running this trail and have run the entire stretch of it up to Lake Orion and back many times training for marathons. It's an invaluable resource! 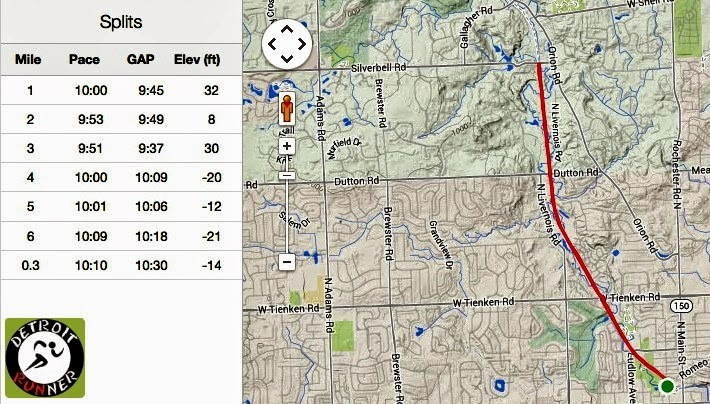 Of course, the event was a unofficial 10k, meaning there was no bibs, no timing, etc for a race but they did have the course measured out to 10k and had a water stop halfway through the race. It was a nice and relaxing atmosphere and, while I don't usually run on Monday's, I did this in place of Tuesday's run. Ben even got a picture of Kevin and I as we were heading back to the finish! After the run, they had water, bagels, granola bars, bananas and fudge since this was the Labor Day Mackinac Bridge "virtual" run. It was their 9th year but the first time I've come to it. Back to the beach sponsored the fudge! They had the mounted police out there as well so I grabbed a quick picture of them. It was a great way to start Labor Day! Consider putting this on your schedule next year if you are in town.